The compulsions of the father are visited on the son, at least in Booster Gold's original iteration. In the twenty-five issues of the character's original series collected in Showcase Presents: Booster Gold, writer and creator Dan Jurgens never comes out and says so, but that Booster has inherited his father's gambling addiction is implicit in the beginning, and in the end. Over the course of the book, Booster would seem to gain some insight into the pitfalls of his relentless pursuit of fortune, but not enough for him to mend the error of his ways; he is wiser, but not necessarily changed. When Michael Jon "Booster" Carter's origin finally comes out, seven chapters into the book, the reader learns that Booster is a fugitive from the future, a disgraced athlete who lost his scholarship for betting on games. Faced with failure, Booster begins what will become a pattern in the book, running away from his problems under the guise of reinventing himself. Booster's actions would seem redemptive on their face -- traveling to the past to become a hero -- but in fact what he's done is to abandon the consequences of his crime, starting anew without taking responsibility for what he did before. Jurgens has Booster "run away to get ahead" twice more in the book, almost exactly in the middle and then again at the end. 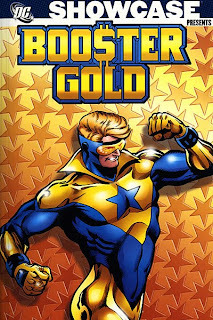 At the end of the series's first year, Booster's profit-driven stardom and ubiquity has led to the kidnapping of his friends, the destruction of his skyscraper, and his being labeled a menace by the city of Metropolis; Booster re-brands his Goldstar company as Booster Gold, Incorporated, and moves to a well-guarded mansion outside of town. Booster is upbeat, but the reader can't help but see this as a kind of defeat for the outgoing Booster, running away instead of redeeming his reputation. Indeed Booster puts so little energy into his second business venture, replacing the first, that his fortune is stolen and his company is bankrupt by the end of the book's second year and conclusion. It is in that conclusion, after Booster's sister dies and he's branded a traitor to the Justice League, that Booster tries to escape again, this time back to the future. It's Skeets, Booster's robot companion from the beginning, who's able to predict that the League will find Booster trying to steal a time machine to return to the future, so well does Skeets understand Booster's patterns. Booster's teammate Blue Beetle, early in their nascent friendship, calls Booster out (rather harshly, I might add), accusing Booster of running away because "life isn't all a party." Beetle has named Booster's affliction exactly, and Booster's recognition of his own action seems enough, this time, to get him to remain in his own timeframe at least. It is not enough, however, to really change the core of who Booster is. On his way out of town, Booster visits the apartment of his secretary and friend Trixie Collins; from the first pages, Trixie has been the voice of sincerity in contrast to Booster and his agent Dirk Davis's profiteering. Here, as is fitting, Booster acknowledges Trixie has been the "one good thing" in his life since he came to the past, and the two share a kiss -- but despite this, Booster's realization only goes so far. Booster's not going to give up his superhero life, he tells Trixie, because to do so would acknowledge that the death of his sister and other events defeated him; instead, he's leaving Metropolis to find "a place I want to be" and "make a few million bucks there." Booster both understands the point and misses it simultaneously -- he is not reinventing himself to the extent of traveling through time, but neither does he stay in Metropolis with Trixie. He knows the value of Trixie's honesty and indeed some of it has rubbed off on him along the way, but he still sets off in pursuit of another get-rich-quick scheme. Jurgens means for the reader to understand that Booster can't help himself. In a coda to the book, Jurgens writes a Secret Origin story where Booster tells his origin to Beetle in the midst of a get rich scheme. It's all news to Beetle, and the surprise on Beetle's face when he understands Booster is a "crook" -- albeit a heroic one -- is striking. Here, Booster states directly what's been hinted before -- both that Booster's father abandoned his family as a result of his gambling addiction, and also that Booster kept betting on his own games even after he'd raised enough money for his ailing mother's surgery. Booster can't make the connection himself -- that he shares his father's own compulsions -- but this wrap-up goes a long way to explain Booster's decisions throughout these pages; even when Booster intends to better for himself, he can't help but be pulled back into his established patterns for doing things. All of this is presented in startlingly brilliant fashion by Jurgens, but that's no slight to the longtime writer/artist, whose work I enjoyed on the Superman titles well before "Death of Superman." Rather, Booster's proximity to the "bwah-ha-ha" days of Justice League International, and the black-and-white newsprint presentation of the Showcase Presents books, give the impression that the material within will be slight, like the simpler 1960s Batman or Justice League stories presented in other Showcase volumes, when it fact its remarkably complicated. Jurgens intricately structures the twenty-five issues of Booster Gold, long before the prevalence of trade paperbacks, into two distinct twelve-issue "seasons" that are themselves split into six-issue arcs, and Booster's growth is clear through each of them. Astoundingly, Jurgens shows Booster's face sans mask just briefly in the first issue, and then not again I believe until issue five; we don't learn the origin of the title character of the comic until issue six! The two-part story in issues eight and nine, just after the origin, smartly use the time travel trope to show us Booster's first days in our time period from the perspective of the future Legion of Super-Heroes, and Jurgens reveals information both about Booster and about Booster's initial nemesis, the Director, leading into the first year's climax. From there, Booster and company jaunt back to the future at the beginning of the second year, with the introduction of Booster's sister Michelle and more revelations about Booster's home life; Michelle's death at the end of issue #22 largely informs the end of the series. To the extent that Booster's origins and motivations are at times a mystery, especially in the beginning, Jurgens places strong emphasis on Booster's supporting cast. Trixie is the series's ever-present conscience, notably in issue four considering events from outside a fishbowl, literally and figuratively. Trixie has for a while a romantic relationship with Dirk, who seems as materialistic as Booster until Jurgens reveals that Dirk has a daughter endangered by the Director. Though Dirk proves an unexpected villain in the end, there's a length of the book in which Dirk appears to be what Booster is not, a man materialistic but also with heart. Two other notable characters that appear in Booster Gold's second year are the behemoth Animal, and the twenty-fifth century policeman Broderick. Animal is a seemingly mindless enforcer for the future police, but he sacrifices himself early on to repay Michelle for saving his life; the moment is largely Michelle's, but just afterward Booster makes an uncharacteristic anonymous donation to a homeless shelter. In the story that follows, Booster refuses an insurance company's money for finding stolen paintings; Jurgens has Booster make a distinction here between profiteering from his fame, which he'll do, and being a hired hero, which he won't. The Animal was the police's hired muscle, and it's not coincidental that Booster begins to stand up for himself so soon after the adventure in the future. Booster brings back an unintentional companion from that trip to the future, the twenty-fifth century policeman Broderick, and their face-off in issue #18 is the best story of the book. Broderick's origins parallel Booster's own -- right down to Broderick, too, having a proclivity for gambling -- and Broderick's fixation on Booster borders on the obsessive, determined to see Booster dead for his time-travel "crimes." Perhaps because Broderick is so crazed, Booster emerges unusually calm in the eighteenth issue, dealing with Broderick and armed robbers all without his super-suit. Booster, running around in a tuxedo, is surprisingly debonair, and exudes confidence that's brave rather than arrogant as he stares down Broderick's gun and lectures the officer on "his responsibility to protect innocent lives." This is Booster's finest moment, demonstrating here -- when no one can see him -- the hero he has the potential to be. Jurgens's Booster Gold reflects the materialism of the 1980s, and the certain innocence that went with it. Booster arrives in 1986 with a flashy costume and an expectation to make money, and it never occurs to him that achieving such might not be so simple. Though Booster performs feats of strength, little of what he achieves is actually his doing, but rather that of Dirk and other handlers. As is the case throughout the book, here too Booster is gambling -- on his own potential for success -- possibly without even knowing that he's doing so. It's no coincidence that in the story, President Reagan is one of Booster's biggest supporters, as the government encouragement of consumer spending at the time would no doubt pass muster with Booster. I would not go so far as to say that Jurgens specifically compares Reaganomics to gambling here, but we do see Booster lose his fortune twice shortly before the stock-market crash of the late 1980s. What causes Booster Gold to succeed, especially despite an unfamiliar and largely unapproachable protagonist in the book's first issues, is the care with which Dan Jurgens presents Booster. Booster is largely the buffoon in his own story, and it would be easy to make him laughable; in part why I never latched on to Keith Giffen's Justice League International was that they seemed to be foolish characters doing foolish things, rather than striving toward some goal. Jurgens is quick to have Skeets point out to Superman at the same time as we learn Booster's origin that Booster is meant to be in the past, that his role as a hero is important and fore-destined; this is a note of respect that serves the character well. In the end, the reader also learns that Booster is part of a fabled "Chosen" who are destined to help humanity; again, if we ever doubt, the book reminds us that Booster is greater than the individual stories might lead us to believe. I've been reading about the Booster Gold character for almost twenty years, but I'd never read these initial issues that encompass Booster's first appearances. I can say they'll probably have me looking at Booster a little differently, and looking at the Showcase Presents format with new respect, too. Showcase Presents: Booster Gold is a deceptively deep collection of twenty-five issues worth of material, enough to really feel you're inhabiting the characters; I give this a high recommendation. I'm not much of a Jurgens fan but after getting such a hefty Booster Gold dose in 52, I picked this up and loved it. I've always found Jurgens to be pretty dated but BG seemed fresh and exciting, which is weird for a book from 20 years ago. A great summary of Booster Gold volume 1, especially the thoughtful comparison between Booster Gold and Broderick in BG 18. It makes me want to read the series again! Gosh I loved that Broderick issue. Had never heard it mentioned anywhere before (though indexed, with a plethora of other Booster Gold information, at Boosterrific, the Booster Gold fan site online), but it was a brilliant self-contained Booster issue. Booster, out of costume, is every bit the hero we know he can be, without even realizing it. And don't get me started on the Booster/Broderick-Valjean/Javert comparisons. Such a good issue. I had no idea that the 80's Booster series was that "deep". As a fan of the recently-deceased series, I was meaning on getting around to reading the original one, but I figured it'd be typical light 80's fare. Glad to hear that I can expect more! Really nice review. Booster was one of the first comic books series I seriously latched onto when I started collecting. The first issue I saw was Booster Gold #7 waaay back in 1986 which was that great shot of Superman pulling Booster's head out of the muck. It was a great image and I loved the SFnal concepts in the issue. I've been buying comics ever since. Thanks. This is a longer review (almost 2x your normal Collected Editions fare), but I felt the material deserved it. Hoping the reader might cozy up with the review in one hand (or device) and the book in the other, and check out some of the things I mentioned. Interesting to hear that these were some of the issues that got you into comics! Sounds like a terrific book (and I'm already a fan of Jurgens' art), although I'm a big fan of color. Let me apologize in advance, as I do not seek to provoke or antagonize, but the past tense of 'lead' is 'led'. Also, I'd love to see your review of Superman: For Tomorrow, should you get the chance. I've been sitting on a review of Superman: For Tomorrow for quite a while; hopefully there'll be a place in the schedule for it before too long.